I had a big rant about DRM last time, and an example of an issue it caused. I thought I'd round off with a few other examples of DRM issues I have experienced in the past. Get all the rants out of my system, before I move on to a post about more positive matters - the new cover for Turner! My last post was about a computer game. Games with online activation are always problematic. See this recent example from Rock, Paper, Shotgun. Or their previous coverage of SimCity, or Diablo 3, or Anno 2070. Or the Ubisoft single-player games that stop working when they upgrade servers (which can then break other games). DRM leads to a cruddy, unstable, frustrating experience. Many of the important arguments against online DRM in games can be found here. Even with physical discs, DRM reared its ugly head. Back in November 2010 I took an afternoon off work to play a newly bought game: Shellshock 2 on DVD. The game used Securom DRM, though I didn't know that at the time, since it wasn't mentioned in the item description when I bought it. The Securom DRM refused to install the game, saying it detected 'Emulation Software'. Yet there was nothing else running on my PC. After a lot of time I decided it must have browsed my hard drive without my permission and refused to let me play the game if I had (fully legal!) software installed that Securom didn't like. So I uninstalled Daemon Tools (used for my music software), but the game still wouldn't install. The Securom website was no help. I tried the Eidos website but that wouldn't even let you email them unless you created an account first. I spent over four hours trying to sort it out (with lots of back and forth emails and phonecalls to Securom). And it still wouldn't run, since the Securom DRM then claimed there was no disc inserted, even though it was. By then I'd had enough. I downloaded a pirated version, scanned it for malware, then installed and started playing that, because the DRM in the version I'd bought made the game unplayable. A month later I had exactly the same issues when I tried to play the game Jericho on DVD. In the end I tracked down a cracked .exe that disabled Securom - I could then play the game I had bought. Nowadays, if a game has DRM then the amount I’ll pay drops by about 90%, depending on how severe it is. Music At the height of the music DRM craze I stopped buying any music. Then Sony et al backed down and you could buy DRM-free MP3s. I rejoiced and started buying again, and now have a huge MP3 collection. The lesson is clear: many customers will pay for something that they feel they then own, but not for things that can be taken back from them. Last year I bought Dragon Naturally Speaking 10. It turned out you needed a serial number to install it, as it was an education edition. To get that I had to send scans of various forms of identification to an email address (which is bad security practice from the start! ), then they said that within 24 hours I should get sent a code. A minimum of 24 hours of waiting to unlock the DRM! I just downloaded a crack and got it running quickly. As usual the DRM causes hassles for paying customers and doesn’t stop piracy. When I first bought a projector I was really excited about being able to watch films by connecting it to my laptop (I don't own a TV). I researched the different options and eventually bought one. It worked well, except that on some films the picture kept getting darker, then brighter again. It was really distracting. I spent weeks trying to find out what the issue was, before I finally discovered it was the DRM system on some DVDs - Macrovision - interfering with the display. I then had a stressful time of it trying to return the projector as not fit for purpose. “It works fine with DVDs, we never guaranteed it would work with Macrovision,” I was told. "You should have checked." "I'd never even heard of Macrovision before this!" I replied. "Anyway, the projector description said you could use it to watch films, and apparently most films have a Macrovision DRM signal included now." "Well, you can't expect the manufacturer to add extra hardware just to deal with an unnecessary and proprietary restrictive system, can you?" Macrovision didn't even reply to my emails. Software with DRM is often downplayed by the publisher. "It's only a one-time activation!". That's a lie. It's not a one-time activation since you have to do it again if you reinstall Windows or get a new PC or want to play it on a different computer or uninstall the game when you've finished and then reinstall it in the future... Basically normal life. It doesn't get better over time. Over the years I have had massive and repeated problems with iPlayer downloads, where it just fails for no obvious reason. It always turns out to be related to Adobe AIR, the DRM system. Usually I have to uninstall iPlayer and Adobe AIR, reinstall them both, sometimes multiple times before it magically works. And then at some point it will break again. I've had similar issues with HTC Sync - the updated version added Adobe AIR (and doubled the size of the files). Suddenly my PC and phone couldn’t recognise each other, cue uninstall, reinstall, debug modes, switching cables and so on. That never worked again no matter what I tried, I had to give up. And no, these issues weren't on the same PC - different PCs, different operating systems. DRM-free is a selling point. I pre-ordered and paid for Witcher 2 at full price despite not having even played the first game yet (which I owned twice, once in a lovely boxed version, once on GOG). I buy more when I feel goodwill towards the publisher. 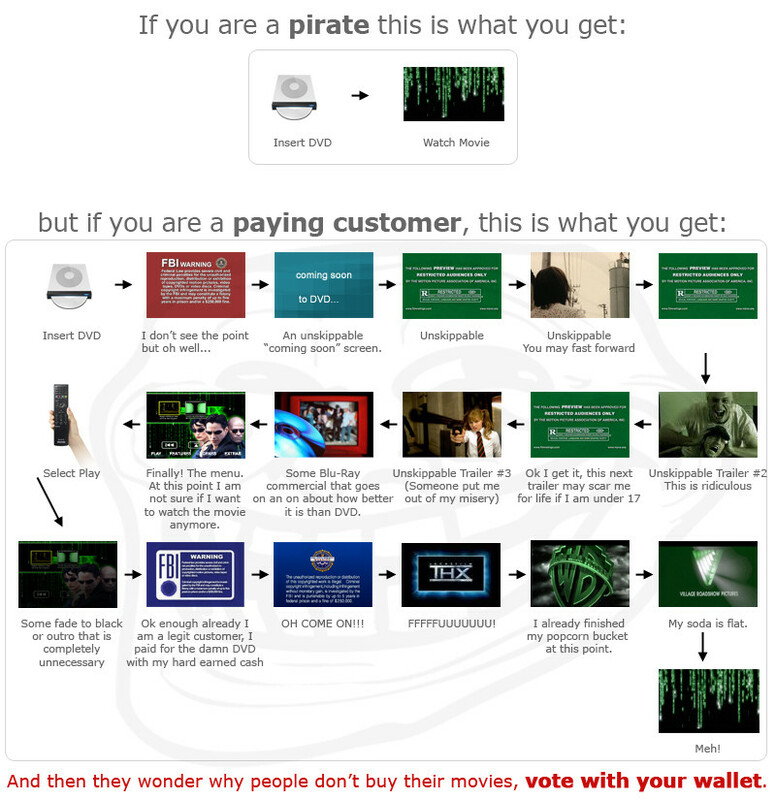 Don't treat paying customers like thieves, or make their life harder than that of pirates. DRM creates mistrust and wariness in the very people the publishers should be wanting a good relationship with. Loyalty is worth so much. Have a look at the Defective By Design site, lots of useful information there. Yeh, I don;t know about bluray but Macrovision came up a lot with DVD players on projectors. I think almost all the Region Free mods for DVD players also disabled the Macrovision. If I recall it was to prevent talking an analogue recording of the DVD and TV's coped fine, but projects didn;t.
It's one of the reasons my excitement about HD video such as Blu-Ray fizzled out: I read an article about the DRM systems built into it, that if it even suspected one of the pieces of hardware was in some way non-compliant with their standards it would downgrade the signal. I just knew there would be problems, so never bothered with it. Which suggests DRM puts early adopters off too, and people like me who are normally really into the implications of new technology. Friendly heads up, Carl: You haven't credited cyanide and happiness for the header comic. Thanks for mentioning that - I'd linked to the source of the image, but I assume from your comment that it comes from somewhere else! I'll look into it and update the picture.